Astrophotography ( ISBN 0540083127 ) begins with a brief introduction to the solar system, planet rotation, and our night’s sky. The book then covers astrophotography equipment, such as various cameras, film, lenses and tripods. There is a nice section that runs you through what’s involved in a night’s photography such as preparations and ending the photo session. Astrophotography then contains several chapters on photographing the moon, the sun, the stars and the planets in turn. Each chapter contains some great information on how best to photograph your subject and it suggests when and how to photograph including the best lenses and exposures to use. The book also contains information on how to build your own Haig equatorial camera mount. There is an interesting chapter entitled “The Earth is a planet too!” which talks about other photography opportunities on our planet including taking shots of aurorae, rainbows, coronas, moonlight and twilight shots etc. Astrophotography also contains information on taking photographs of meteors, satellites, aircraft and comets. There is then a chapter on processing your film, which is only of information to you if you use a non-digital camera. Finally the last chapter is about digital photography, and new motorized and GoTo telescopes and what they mean to astrophotography. There is also information on performing afocal photography, which is where the camera is held or fitted to the eyepiece of the telescope. The use of CCD cameras and web cams are also discussed. This edition of Astrophotography is the updated edition of 2002. I think one main area that disappointed me about this book was that I expected it to go into great detail about digital astrophotography, web cams and how to get the best out of pictures by using software such as photoshop. Unfortunately the book does seem dated as it mainly covers 35mm film photography with just some information on digital photography at the end of the book. I think the book could do with a complete re-write. A lot of the information about astrophotography is common between whatever camera you use, but I would have thought that most astronomers now use digital cameras and laptops etc. Otherwise astrophotography is a good book containing a lot of information about how to take photos of our solar system and the colour photos are really good. 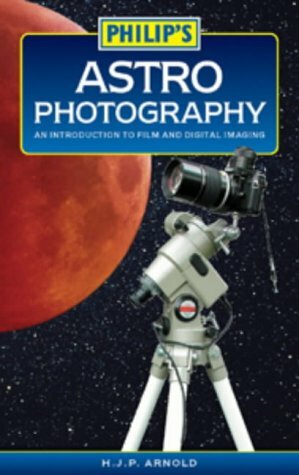 Overall Astrophotography is a good book on the introduction to film and digital photography, but it could have included more information on the latest imaging technologies and astrophotography imaging techniques.